Kevin Alexander ate 330 hamburgers last year, but he hadn’t yet tried this one. Writer Kevin Alexander says he’s always had a “deep passion for burgers,” especially the thin-patty, diner-style variety. As the “chief burger critic” for food and entertainment site Thrillist, he’d rated dozens of them in the hunt for the best hamburger in the country. But last year, he grew tired of tackling the topic in a haphazard manner, sometimes relying on other editors’ reviews. So he convinced his bosses to let him embark on “Burger Quest“: “a full tour of the country,” tasting “as many burgers as possible.” Thirty cities and 72 flights later, Alexander had ingested 330 hamburgers, more than double the number Alan Richman gorged for GQ for a similar project back in 2006. Along the way, Alexander picked up some fascinating tidbits about Americans’ love affair with ground beef. In its early days, the dish was really about “working class food that you need to carry somewhere and eat quickly,” he told us on our latest episode of Bite. “You really get to know a city and a region by their burgers,” he says: Oklahoma’s onion burgers emerged out of the Depression, “because you could pack onions into the meat and it’s cheaper.” In the dairy-loving Midwest, Minneapolis’ “Juicy Lucy’s” come with melted cheese jammed into the middle, and Wisconsin’s signature burgers are topped with melted butter. “You’re sluggish, and you almost feel drunk from all the red meat in your system,” Alexander says. Alexander had some concerns about what Burger Quest might do to his body. “My doctor was very worried about the effects of all that red meat,” Alexander says. He was advised to get plenty of exercise and water, and eat oatmeal and greens on the days he planned to sample several burgers in a row. Subsidized burgers may sound like a fantasy, but “honestly, you feel horrible at the end of the day,” Alexander says. “You really do. It really messes with you. You’re sluggish, and you almost feel drunk from all the red meat in your system.” By the end of the year, he was a little less healthy, but “not so much so that it was alarming.” His cholesterol went up 16 points, but “it wasn’t Super-Size Me,” he says. Alexander limited his quest to beef burgers, so he still hadn’t sampled the Impossible Burger—a highly-publicized vegetarian patty that supposedly cooks and tastes just like meat, and even appears to bleed. (The burger is getting flack this week for its controversial special ingredient, “heme”). I took him to lunch so he could evaluate this futuristic hamburger using the same criteria he applies to beef burgers. Find out what he thought by tuning in to Bite (segment starts at 1:45 of the episode above). 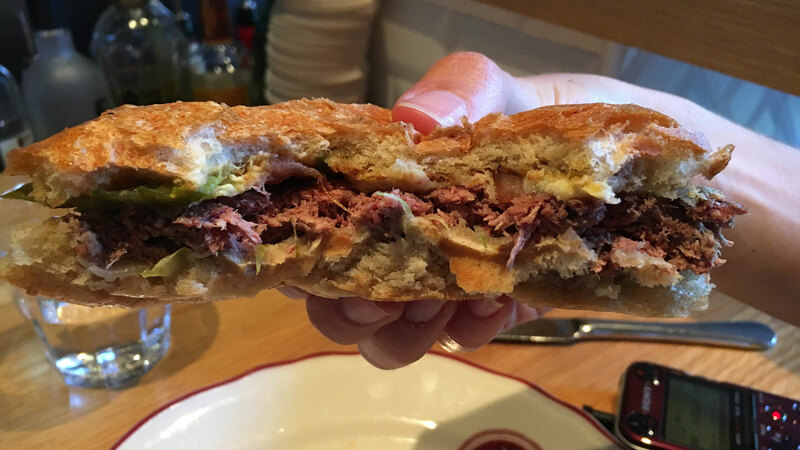 The Impossible Burger as served at Cockscomb restaurant in San Francisco.